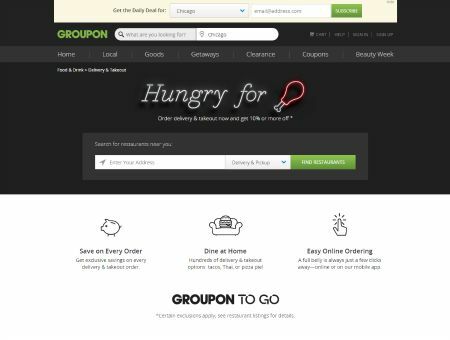 Coinciding with Groupon’s recent acquisition of OrderUp, a food delivery service, the savings and deals marketplace has today announced plans to expand further into the delivery and takeout industry with the launch of Groupon To Go. Launching solely in Chicago, more than 500 eateries have signed up to be part of the new service including popular restaurants such as Quiznos, Al’s Beef, Ditka’s Restaurant and Rosati’s Pizza. Users that leverage the new service will save 10 percent or more in the form of instant cash back on every order at participating restaurants. Groupon states the new service will be expanding to other major cities in the US during 2015 including Austin, Texas and Boston, Massachusetts. Groupon also states that future improvements will include real-time order tracking, group ordering as well as the ability to schedule delivery and takeout for another date and time. “Most people get delivery and takeout multiple times a month, and with Groupon To Go, we’re giving them an easy way to save money every time they do so,” said Sean Smyth, vice president and general manager, Groupon To Go. “Delivery and takeout is a natural extension of our local deals marketplace, adding hundreds of the best restaurants to Groupon––including many that haven't offered online ordering until now."